Save time and money while sanding with Abranet® Sanding Screen Sheets. Abranet® cuts faster, lasts longer, and will not load like ordinary sand papers. 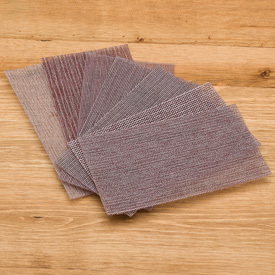 The Abranet® Variety Pack includes one sheet of each grit. Sheet size: 2-3/4" x 5"
Comments On Jan 21, 2019:I found the sheets effective. My only reservation is the short life they seem to have even when washing between uses. Comments On Jan 23, 2017:When using regular sandpaper I am concerned about continual clogging especially when sanding oily woods. The Abranet can be cleaned with just a flick of a finger and the sanding continues with no delay. I bought several packs of the Abranet Sanding Sets but I'm still using first set because they have lasted so much longer than expected. They work great on acrylic and wet or dry sanding of woods including oily woods. Comments On Jan 03, 2017:i mainly use this sanding screen for crushed rock inlay. it cuts fast doesn't load and lasts a long time. Comments On Dec 01, 2016:I like the Abranet a lot, it lasts much longer than sandpaper and is easy to clean out between uses with a little bit of compressed air. Comments On Nov 09, 2016:I love this stuff. I use all but the 80 grit when making my pens. I like the fact that it's self-cleaning as opposed to standard sand paper. I easily collect the dust for each different wood out of the Abranet and then use it to make small repairs where needed. Comments On Sep 13, 2016:Purchased the sanding pack and very happy with purchase. Durable, reusable, easy to clean, and cuts beautifully leading to excellent finished wood with friction Polish I enjoy using. Highly recommended. Happy I came across this. Will save me a bundle. Comments On Aug 07, 2016:I'd like to give 4.5 stars as I think sandpaper is better for dry wood. These shine when wetsanding though. Whether it's an acrylic blank or a finished wood blank, Abranet outperforms sandpaper during the wetsanding phase. They seem to last quite awhile too, so overall you'll save money by not going through so much sandpaper. Best abrasive on the market. Period! Comments On Dec 07, 2015:I was a little hesitant to try this product but once I did I was hooked. In my opinion there is nothing more annoying than sand paper that loads quickly and then is hard to clean to re-use. Abranet makes sanding a snap. As soon as the sanding screen loads, just give it a little tap and you can go back to sanding. I've noticed that it also lasts longer over all. Try this product! You won't regret it. Comments On Oct 25, 2015:I bought these to test out for the first time. I am glad that I did. No build up, flexible for those tight spaces, and last a long while. Comments On Oct 27, 2015:These are amazing. They beat the old rolls of sandpaper, hands down! I highly recommend these for use on acrylics and stabilized woods. Best sandpaper I have EVER used!! Comments On Jul 30, 2015:I've been making things with wood for 12 years, and never heard about this stuff until I started wood turning. I purchased ONE package that I have used for EVERYTHING, and haven't had to replace it yet. That's over 2 weeks of almost constant use! I will NEVER use regular sandpaper again! Comments On Jul 19, 2015:This stuff cuts through material like a laser and it keeps going for weeks. I've managed to use the same set of Abranet sheets for weeks at a time. They may seem expensive, but when you see how long you can make them last, you'll see the value in them. Comments On Jun 03, 2015:Where have these been all my life? What a super way to finish acrylics. You get the the best finish ever. I then finish it off with Dr Kirks 3 step process. Comments On Apr 19, 2015:Works great when sanding oilier woods, or woods that have a higher pitch. It doesn't gum up as quickly! Works great! Comments On Apr 01, 2015:This abrasive is excellent for both wood and acrylic projects. It cuts different than traditional sandpaper. Comments On Apr 02, 2015:I have been using the rolls of sandpaper, available everywhere, until I recently decided to try Abranet. I had no idea how much better it worked until I tried it. The design allows the dust to fall through and doesn't clog up the sanding medium, like paper does. I will never go back. Comments On Apr 02, 2015:It's great sand paper! Although I hear many people tout that this stuff lasts forever, I find a noticeable decline in performance after even 3 pens. It is still worth it, however, because the paper is even and you get a nice finish. Oddly enough, the 600 grit wears out considerably faster. So don't be afraid to buy some extra 600. Comments On Jan 12, 2015:Lasts forever and great results! Comments On Nov 23, 2014:I bought this on a whim and I am glad I did. I can not believe how good it work or how long it lasts. I haven't worn it out yet, and I have been using it for months. Comments On Oct 16, 2014:Bought these to tryout. They worked out just great. The 400 & 600 grit were especially good for finishing. Ordered some 600 grit. Comments On Oct 02, 2014:I am amazed that something so simple as sandpaper could be improved and with this product it has. The paper mesh is durable. It made my sand smooth and effortless. I love how the mesh does not bog down when sanding. I believe it was stated in another review that all you had to do was flick the paper every once in awhile and the paper was good as new. Now remember this product is sand paper mesh it will wear down just like sandpaper, however it does hold up longer than your ordinary sandpaper. Comments On Sep 16, 2014:The Abranet Sanding Screen is the best material I have ever used. When the screens load up all it takes is a tap and the screens are clean. I only wish they had grits over 600, and an assortment of different sizes would be nice. Comments On Sep 05, 2014:These don't clog, cut very quickly and finish down to 600 grit in just moments. An excellent product! Comments On Jul 10, 2014:the material that this is built on is nice to use in the small spaces of the pieces that I turn. It seems as though the finer grits wear out faster than I thought they would.